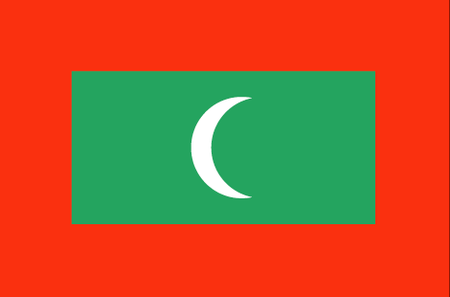 Maldives is a nation in the Indian Ocean located off the southern tip of the Indian subcontinent in what is called the Laccadive Sea. Its dozens of islands and atolls were first settled by peoples from southern India around 2000 years ago and were subsequently ruled by Buddhists and then Moslems. Beginning in the early modern period, Portugal, Holland and Britain exercised control over what was and is a major shipping lane between Asia and Africa; the British ended up ruling for nearly 100 years, until independence was granted in 1965. The Maldives experience the typical, tropical climate for the region, with a dry season in the winter and a rainy season in the summer, while the influence of India's landmass creates conditions for strong storms. The islands are especially susceptible to disturbances on the sea because of their low altitude, averaging less than 5 feet, with the highest point less than 8. Along with fishing, tourism is the lifeblood of the economy, with more than half a million visitors coming yearly for the pristine beaches and crystal blue waters. There is currently a single golf course in the Maldives, Villingili Golf Course run by Shangri-La Hotels and Resorts. Situated on the far southern end of Villingili Island, the layout makes the most of the native flora and fauna, and its mix of par 3 and par 4 holes, averaging around 120 yards, are designed to appeal to everyone from the casual player to the serious golfer.